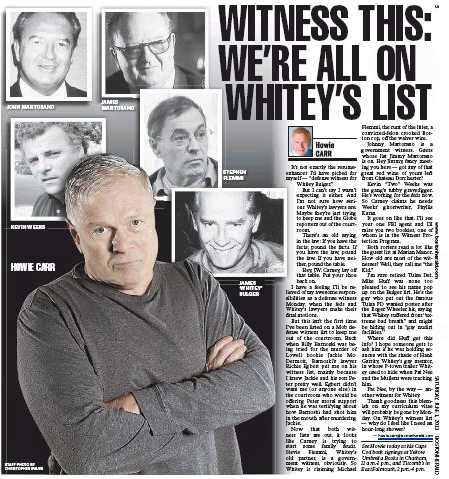 As the hardreading staff noted earlier, the Boston Herald is all aglow over the imminent trial of James “Whitey” Bulger, especially the personal involvement of its star columnist Howie Carr (who “vowed to watch Whitey every step of the way through judgment day,” according to the feisty local tabloid). But I can’t say I wasn’t expecting it either. And I’m not sure how serious Whitey’s lawyers are. 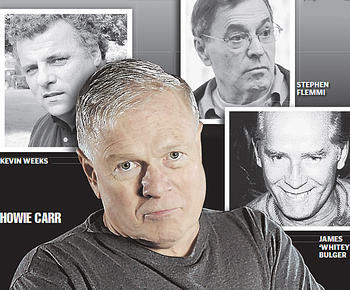 Maybe they’re just trying to keep me and the Globe reporters out of the courtroom. There’s an old saying in the law: If you have the facts, pound the facts. If you have the law, pound the law. If you have neither, pound the table. Hey, J.W. Carney, lay off that table. Put your shoe back on. That’s a relief, eh? He can then go back to “watching Whitey every step of the way” yak yak yak. This entry was posted on Saturday, June 1st, 2013 at 3:45 pm and is filed under Uncategorized. You can follow any responses to this entry through the RSS 2.0 feed. You can leave a response, or trackback from your own site.